Swimming pools are places where many people come together. Each person not only carries billions of micro-organisms, people also bring organic contamination in the water (skin particles, hair, sweat, ..). Without disinfection the water would quickly have an unpleasant odour and waterborne infections would be transferred from person to person. For health reasons it is therefore imperative that swimming pools and spas should be properly disinfected. For main and residual disinfection of pool water, chlorine-based reactant is still the main disinfectant used. However, it is well-known that chlorinating the water can lead to the formation of a complex mixture of disinfection by-products (DBP’s), depending on the type and amount of organic material present. Among the most-described pool-related DBP’s are the trihalomethanes (THM’s), haloacetic acids (HAA’s), haloacetonitriles (HAN’s), trichloramines and haloketones. As a parent, you can probably relate to this: in the summer you set up a swimming pool so that your children can swim and play in the sun. You want to keep the water clean and safe, without having to use the harmful substance chlorine. When using traditional means, the children regularly come out of the water with irritated eyes and discoloured swimsuits and hair. The search for equally effective water disinfectants with less formation of DBP’s therefore remains very important, especially to protect more vulnerable bathing guests, such as babies, young children, asthmatics and the elderly. 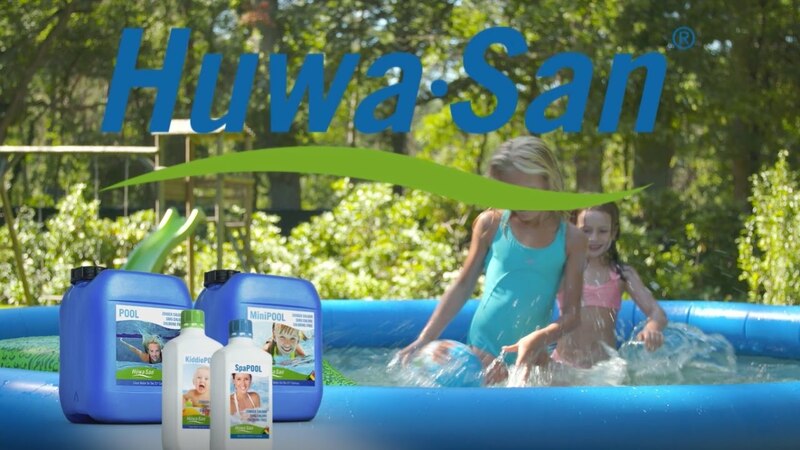 Check out our Huwa-San for Pool disinfection video! *** Attention: Huwa-San is a biocide and subject to certain laws and regulations per country. As a result, in some countries, our full range isn’t available. Please contact us for more information on our registrations. Use biocides safely. Read the label carefully before usage .